Rebecca Jenkins looks back to when London first hosted the Olympic Games and how a mix up with flags gave birth to the first Olympic protest. 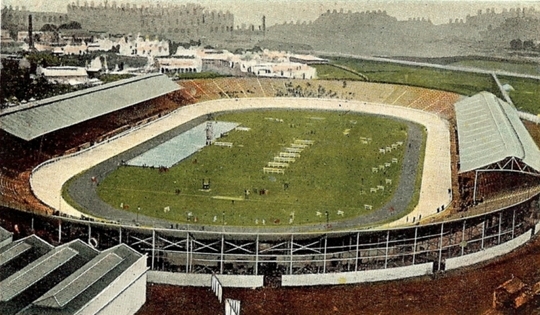 1908 postcard of the White City Stadium, the main arena built especially for the 1908 Olympics. Just over 100 years ago London hosted its first Olympic Games – the Fourth Olympiad of 1908. It was a fledgling version of what we have today – only 2023 athletes competed, approximately the same number that will contest the Athletic events in 2012. Of course, the Olympic Games were rather different then – there was no torch relay, or spectacular opening ceremony with a stadium transformed by pageants of England’s green and pleasant land. In 1908 the tug-of-war was a medal winning contest, as were massed gymnastic displays (very popular with the northern European nations with military conscription) and marathon runners were not encouraged to re-hydrate, so the winning time wouldn’t have even qualified a modern athlete for the Olympic team today. It is well know that in 1908 the marathon was run for the first time at the modern Olympic distance of 26 miles, 385 yards. But what is often overlooked is that these Edwardian games were the first to have an opening ceremony revolving around a parade of nations; in short, the first London Olympics witnessed the birth of Team GB. It has been said that whereas the Germans excavated Ancient Olympia and the French reanimated its spirit, the Edwardian sons of the British Empire set out to organise it. In the first Games of the modern Olympics, any one – or perhaps more accurately, any sporting man (Baron de Coubertin, the “father” of the Olympic movement, did not approve of women performing in public sporting contests) – who had the private means to turn up at the venue could put himself down to compete. Photograph of Team GB in the opening ceremony's 'parade of nations', from the Fourth Olympiad 1908 London Official Report published by the British Olympic Association in 1909. 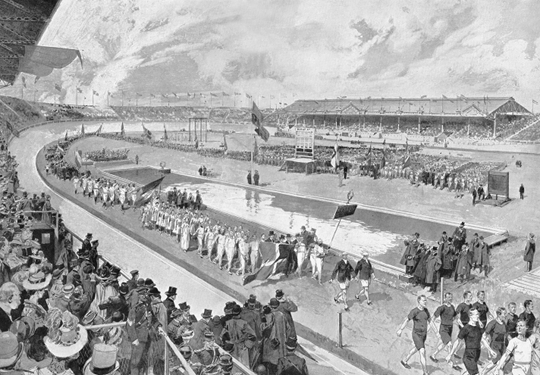 Engraving of the opening parade from the London Illustrated News, July 1908. The eye of the Olympic spectator was moved irrevocably from the individual athelete to the flag they wore on their chest. And flags, as the Edwardian organising committee soon discovered, cause conflict. In 1908 the US Olympic Committee sent their largest team so far to the Olympic Games: 122 men (no women), in team costume with the stars and stripes on their breast. The managers of Team US 1908 were determined that they were going to sweep England off the athletic map. The ground they chose was track and field and their modern gladiators were dominated by Irish American track and field stars from New York. 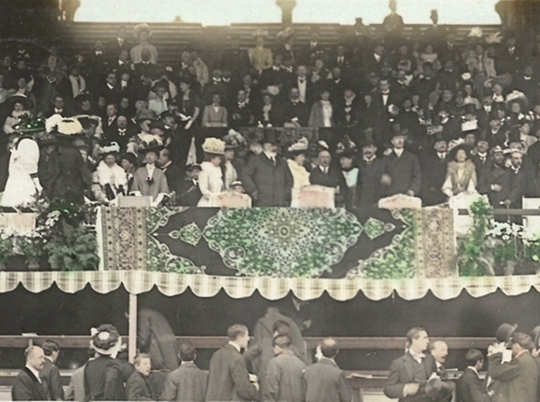 1908 postcard (cropped) showing King Edward VII at the opening ceremony. It was, perhaps unfortunate, therefore, that in the rush to prepare the White City stadium for King’s arrival to open the Games on the afternoon of Monday, July 13th, 1908, the national flags run up the poles included those of Japan and China (neither of whom would send representatives to the Olympics games for some years yet), but omitted those of Sweden and the United States of America. The Crown Prince of Sweden, president of the Swedish Amateur Athletic Association had been a key supporter of the Olympics since their revival. He and the Swedish Government had – unlike the British government – provided substantial subsidies to send the third largest national team to London for the 1908 Games. And, Prince Gustavus, an honoured guest of the British King and Queen, was among the royal party in the royal box. The Prince was polite in front of his royal hosts about the omission of his national flag. The American Committee however suspected a deliberate insult. They produced their own Stars and Stripes and had it run up the pole. The Swedes had to make do with the single flag carried before their team in the parade. The parade climaxed with the massed ranks of athletes behind their flagbearers facing the royal box. With a fanfare from the trumpeters of the Life Guards, the flag were dipped to salute King Edward VII; every flag, that is, except the Stars and Stripes held by the Californian law student and shot putter, Ralph Rose. 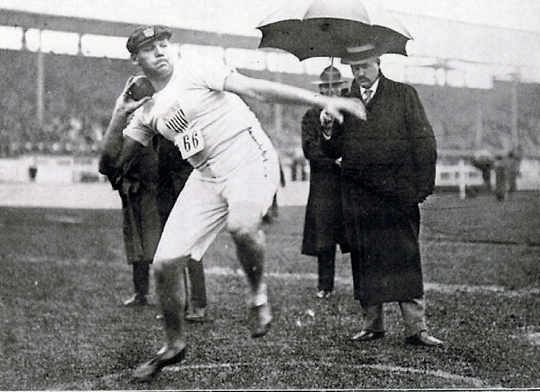 Photograph of Ralph Rose in shot-putting action, from the Fourth Olympiad 1908 London Official Report published by the British Olympic Association in 1909. The British press at the time over-looked the incident, but the Irish paper in New York, The Gaelic American, picked up Rose’s gesture and made much of it. When an American sports journalist revived the story in the 1950s, it told of Ralph Rose being “taken aside” the night before the opening ceremony by a core of Irish American athletes determined to make a stand against the British tyrant who oppressed the Irish. ‘This flag dips to no earthly king’, the young democrat was supposed to have said as he held his flag high. Historians dispute whether the words were actually said by Rose or were a later embellishment to the story, but the fact remains that after 1908 the national Olympic team was here to stay and 1908 US team had made the first Olympic political protest. 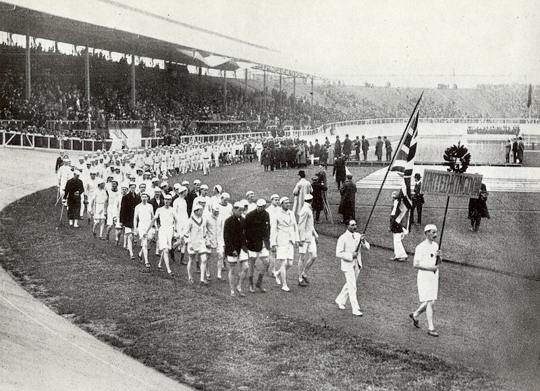 A Flickr slideshow of photographs from the Fourth Olympiad 1908 London Official Report published by the British Olympic Association in 1909 – via Wikimedia Commons.